Written with the harried IT manager in mind, Open Source Security Tools is a practical, hands-on introduction to open source security tools. Seasoned security expert Tony Howlett has reviewed the overwhelming assortment of these free and low-cost solutions to provide you with the “best of breed” for all major areas of information security. Inside, you’ll find everything from how to harden Linux and Windows systems to how to investigate breaches with Sleuth Kit, Autopsy Forensic Browser, and Forensic Tool Kit. 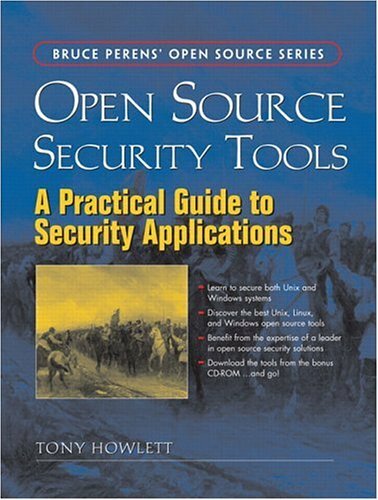 For each security task described, the author reviews the best open source tools and how to use them and also provides a case study and sample implementation. Advice and practical tools for protecting our computers. You will learn how to plan and execute a strategy that will thwart the most determined and sophisticated of hackers, while still allowing your company easy access to Internet services. Ethical hacking, which encompasses methodical penetration testing, white hat hacking, and vulnerability testing -- involves the same tools, tricks, and techniques that criminal hackers use, but with the target's permission in a professional setting. This book provides information about how to use free Open Source tools to build an Intrusion Detection System. The author provides detailed information about using SNORT as an IDS and using Apache, MySQL, PHP and ACID to analyze intrusion data.